Ireland's Conor Murray is "lucky" he is fit to face Italy after being caught by the boot of England's Mike Brown, says assistant coach Richie Murphy. 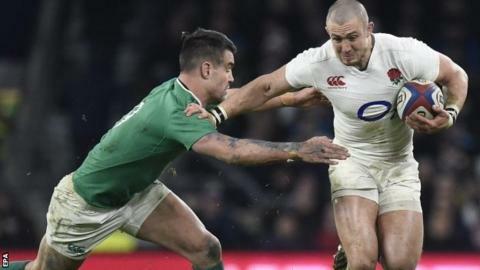 Scrum-half Murray needed eight stitches around his left eye after Brown tried to kick the ball from his hands during England's win on Saturday. Brown was not cited for the incident. "Conor's got a split next to his eye, he's had eight stitches but he's grand," said Murphy. "He didn't train today, we're just looking after him." Munster player Murray, who toured with the British and Irish Lions in 2013, looks certain to be available for the Six Nations match against Italy on 12 March. "He's obviously a little bit bumped up," said Murphy. "He got a bit of treatment in the [England] game, so it's a case of looking after him." Both referee Romain Poite, who reviewed the incident on the big screen at Twickenham, and the citing commissioner decided no action should be taken against Brown. England coach Eddie Jones said Brown, who scored a try in the second half, had done nothing wrong. Ireland prop Mike Ross also played down the incident, saying Brown was entitled to attempt to kick the ball. "If the ball's exposed you're going to try to get at it by any means necessary," said Ross. "You can always stick a foot through and kick it out. It's a part of the game and probably a bit unfortunate that Brown's heel caught Conor there." However, former Ireland captain Keith Wood felt Brown should have been cited for dangerous play. Speaking on Sunday, he told BBC Sport: "You have to be careful what you are doing with your feet. Brown kicks through Murray, he kicks him in the face and he will be cited, he has to be cited. Meanwhile, Ireland centre Jared Payne is on course to face the Italians after coming through a fitness test on Tuesday on the hamstring injury that ruled him out of the England game.